Great Leadership by Dan features a regular stream of high-quality articles on such topics as how to act like a leader, succession planning, performance management, and much more. Blog posts are often written by guest bloggers and their cross-section of opinions and views adds to the breadth and depth of this valuable website. Management Craft tags itself as ‘Discussions about state-of-the-art business management’ and we whole-heartedly agree with this description. I discovered this site via a link from another site to the classic post “Birthday Butterfly Flap Post”. This is a great resource for managers looking to refine their craft. Marshall Goldsmith has years of management experience and skill under his belt and his website is a wealth of information for those who manage teams both large and small. For a truly enlightening read, check out this page that contains eleven excellent leadership articles including ‘Try Feedforward Instead of Feedback’ which greatly effected much of our thinking about the concept of feedback. Forbes’s sub-site is definitely not the most focused on this list but that doesn’t make it any less valuable as a management resource. Because of its famous brand name, this website benefits from New York Times best-selling guest writers of the highest quality such as Christine Comaford, George Bradt, Lisa Quast, and Cathy Huyghe. Posts are often infrequent on The Practice of Leadership blog, but when they arrive, they are usually pretty beefy and in-depth. Be sure to check out the recommended reading section. Sure it’s intimidating – who has time to read and review all those books – but it’s also a great resource for all things management related. John Hunter’s blog is not a direct leadership blog per se but it does touch on leadership issues via posts on lean thinking and manufacturing, six sigma, customer focus, systems thinking, Toyota Production System, and innovation. It’s well worth the time it takes to find the leadership articles as Mr. Hunter has some interesting ideas from a corner of the world we don’t hear much about (Southeast Asia and Oceania). Linked 2 Leadership describes itself as, “a group of global professionals dedicated to leadership development, organizational health, and personal & professional growth”. We describe it as a solid leadership-based website with a profoundly dedicated fan base. The site has a pretty extensive roster of guest bloggers who integrate such disparate topics as Education and Technology and make it all relevant. Wally Bock’s Tips of the Day are the highlight of this site and we find ourselves checking this site several times a week to catch up on Mr. Block’s words of wisdom. Recent tips include: ‘Keep a list of mini-projects’ and ‘Time off should be time off’ – sage advice for managers coping with a variety of issues. Sometimes it’s easier to figure out what the right way is by seeing it done the wrong way. That’s the heart of the message that Dilbert creator and writer has illustrated for over twenty years. Learn how not to lead at Dilbert.com! 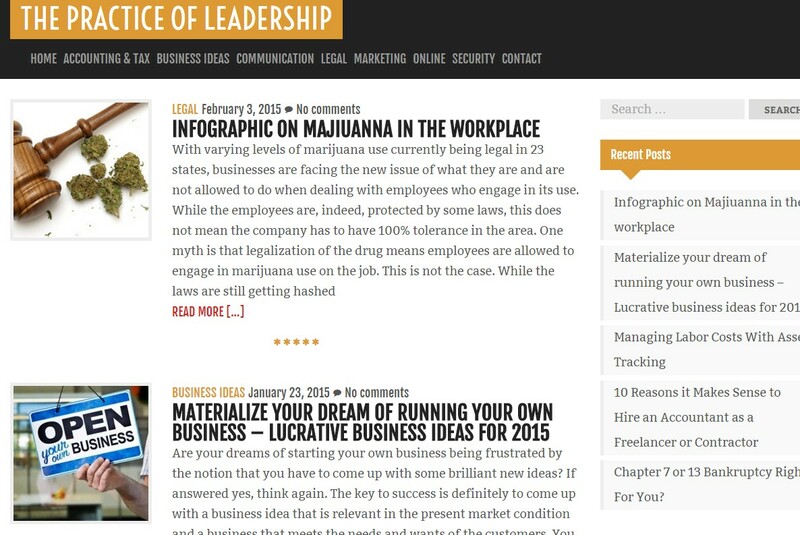 Take a few minutes each day to check out our top ten leadership websites, bookmark your favorites, and create a resource that you can refer to for ideas, inspiration, and continuing education in the ever-changing world of management and leadership.